- Select Function: DM62, DM62B, DM62BD, DM62B-OS, DM62D, or M62-OS. - Delivery: The Securitron DM62 Magnalock is factory-ordered, please allow 3-4 working days' lead time. The Ultimate Magnalock® Double Magnet for Indoor/Outdoor Higher Security! The versatile DM62 electromagnetic lock offers strength and ease of maintenance for interior, perimeter and exterior access control - in a compact double magnet. This all-in-one unit is designed for double doors with no mullion. With unsurpassed durability, the DM62 will last long after most buildings wear out. 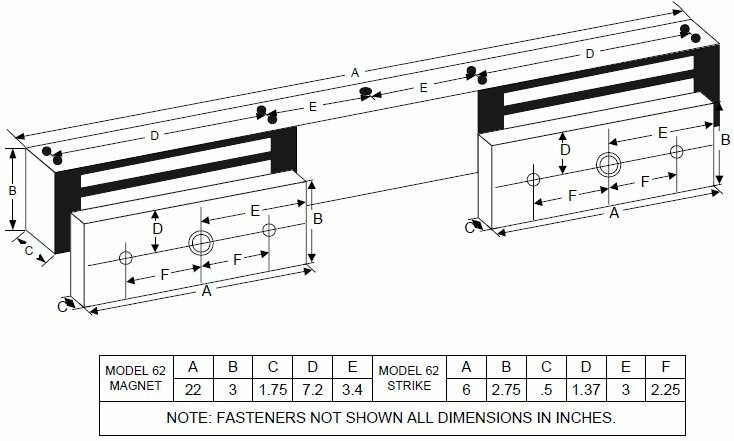 Note: A pair of Offset Strikes may be required for proper installation of the DM62 in aluminum frame door applications. - 3 ft. [1m] of jacketed, stranded conductor cable. - ANSI/BHMA A156.23, Grade 1; E08511-1000.